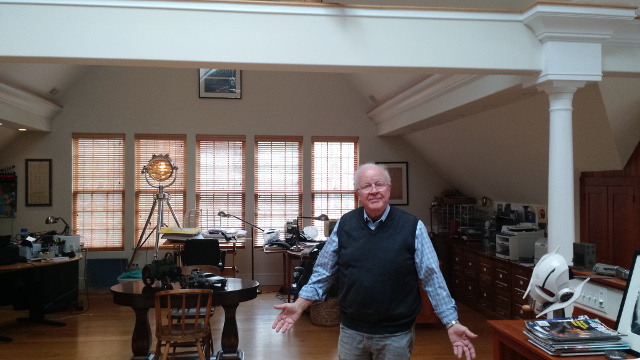 Movie visionary, Doug Trumbull, has developed an advanced capture and display solution called Magi. It is based upon images captured and displayed in stereoscopic 3D, 4K and 120 frames per second. It is a solution that can be used in many areas, not just theaters, and he has been working hard to develop the concept and gain advocates. It is a huge task to develop a whole new capture and display format and roll it out successfully. But he has done it before – with IMax, so maybe he can do it again. After seeing some test footage in his Magi theater, I can say it is a unique immersive experience that many will find compelling. Trumbull has no shortage of ideas and projects to pursue, but he can’t do this alone. It will take many partners and investors, so if you like what you read below, make the trek to Trumbull’s studio and development lab in western Massachusetts. We had a chance to visit to learn more yesterday, which I want to report on here. Trumbull’s studio is in the middle of the woods – just the way he likes it. While he grew up in LA and spent his early career there, he left in the mid 80’s, frustrated with the way Hollywood ran the business. He thought movie makers could create a much better experience, which has been his mission ever since. So why settle in western Massachusetts? He said he used to have a house in Maine and loved New England, so he bought the place as it is located in a very ‘artsy’ area. And quite a place it is – more like a complex. Once past the gate, there are a number of wooden and sheet metal buildings spread over the hillside. There are chickens running around, corralled goats, geese and more. There is even a saw mill on the property that has been used to create the timbers to build some of the facilities, along with a complete woodworking shop so they can make their own sets as well. In addition, there are two “studio” buildings. One houses the current Magi theater and development area while a newly completed building is now going to be outfitted to shoot new productions. Trumbull’s goal is to make movies that offer the same magic that he felt as a kid going to see Cinerama movies on 100’ curved screens. That immersiveness has been lost, he thinks, and the Magi system is a way to capture that magic again (it may be no coincidence that Magi is simply magic without a “c”). To begin our meeting, we sat in a nice cozy area to have a chat. He started noting a fundamental flaw in the way that stereoscopic images are captured and display today. “The left and right eye images of a 3D frame are captured simultaneously, but they are displayed time sequentially. That means there is automatically a subtle artifact because the motion in the left and right eyes that the user perceives is not synchronized. In the Magi system, we capture left and right eye images 180 degrees out of phase so they match up with the way they are presented on a single DLP projector.” Trumbull uses a single Christie Mirage 4K25 simulation projector as these units can present 4K, 120 fps, 3D images without any modification. That’s a different approach than that pursued by Ang Lee in his 4K, 3D, 120 fps movie, “Billy Lynn’s Long Halftime Walk.” Trumbull explained that Lee visited his studio 6-7 times and they were very open with him about the technical process, but he did not adopt Trumbull’s solution. Lee captured the 4K left and right images simultaneously at 120 fps instead of time sequentially in the way Trumbull prefers. Lee then chose to project the film at 4K and at 120 fps per eye, whereas Trumbull projects at 60 fps/eye. This choice meant that Lee needs to use two non-cinematic projectors to achieve the bandwidth needed for this high data rate. Trumbull’s approach requires only one projector – a standard theatrical projector. Stereoscopic 3D is a way of fooling the eye and understanding the psycho-physical mechanisms of this process is something Trumbull is very interested in. To pursue this, he is working on a study with Baylor University that will seek to evaluate frame rates, field of view, shutter angles and more in an attempt to better understand where subtle artifacts may be having an impact on the experience. Trumbull also does something very different with his screen. First, it is shaped like a toroid to naturally focus light and sound toward the center. But in addition, the screen has a 3X gain. With domed, cylindrical and toroidal screens one typically uses a gain of less than one so as to not degrade the colors and contrast on one part of the screen with light “cross reflecting” from another part. The reason Trumbull’s solution seems to work is that the seating area is limited and the screen size is matched to the viewing space. For example, in the Magi theater, there are only 60 seats. These rise rather steeply so every seat has a clear view of the screen. The screen about 30’ (9m) wide and the field of view from the front row is 100 degrees. While the front row is only 15’ (4.5m) from the screen, it feels somewhere between a theatrical and a VR or a Barco Escape theatrical experience. But in the demos we saw later, the screen comes alive as a 3D volume, creating very good immersion. Personally, I would have liked a wider screen, but this may create some cross light contamination and it presents more challenges from a story telling perspective. Audio wise, a number of Christie Vive speakers are arranged around the room, but the screen is not perforated so the center channel is a phantom channel created with the speaker array on all sides of the screen. 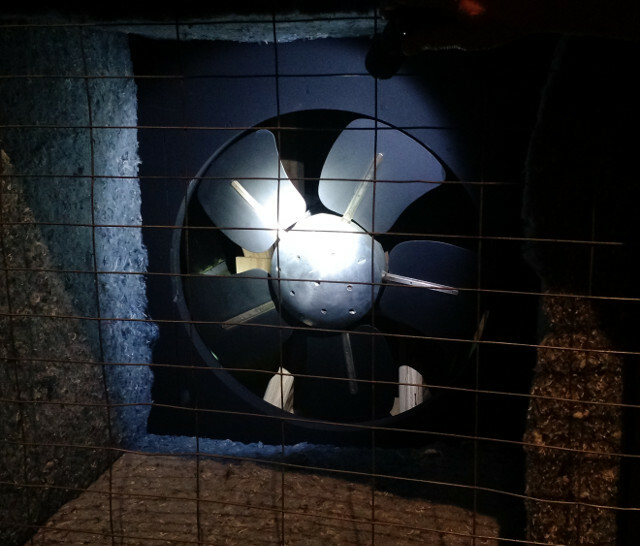 The walls are covered with sound absorbing materials so the theater is nearly acoustically dead, which is one of Trumbull’s purposes – to include reverberation only as needed on the soundtrack. The projector is from Christie and is mounted on the ceiling but rather close to the screen. IMAX theaters typically have a screen width to projector distance ratio of 1:1, but the Magi theater is even more immersive at 0.75:1. 3D is created using active shutter glasses from Christie that use an IR sync signal. All of these positions and the design of the theater were arrived at empirically by running test content and changing the projector position, projector lenses, screen curvatures, FOV, etc. As a result, Trumbull is convinced they have the optimum design that ensures that every seat in the theater has perfect images and sound. I should also mention there is a 4D element to the experience as well as the seats can move just a little, providing jolts from time to time. I was happy to see this was not over used. The movement is accomplished with an Eminent Technologies rotary sub-woofer system that runs under the seating to add rumble in the 1-10Hz range. Trumbull then showed a series of clips to showcase the Magi theater. First up was the UFOTOG film that he created about two years ago. This was all done in the same building that the Magi theater occupies and is the story of an amateur astronomer who finds a way to prove aliens are here today – much to the dismay of the federal authorities. 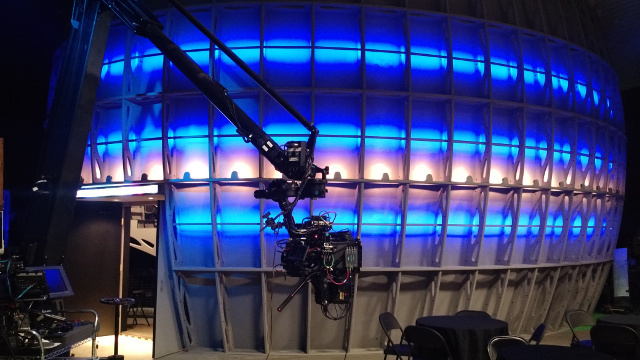 Sequences were shot at a variety of frame rates but all projected at 60 frames per eye. I had to watch the film twice to grasp both the story and to look at the images more critically. First off, this is really fine image quality that has that “cinematic look” – something the Ang Lee film does not have (and just the complaint that Trumbull expressed). There are CG and live action segments in the short piece and lots of practical visual effects (something Trumbull is also a master at). The resolution and crispness of the image is immediately apparent. I even noticed one hair on the main character’s face in a shot. This is not high dynamic range, but it may not be required. There are night time scenes and the black level was fine. While HDR might add more punch to some of the brighter parts of the image, I suspect Trumbull would be concerned that this might alter the cinematic look too much. The 3D was clearly immersive and offered a very large 3D volume. My eyes are getting a little old and I am having a hard time fusing objects if they are too close to me. This happened on some shots, but that is clearly a personal issue (Trumbull is older than I am and having no trouble converging these images). To nit pick a little, I did see some 3D errors along with some ghosting in some sequences (bright objects on dark backgrounds), which are always an issue. Overall, it was an impressive piece. Trumbull then showed some other clips. One was a performance capture experiment where the actors were inserted into robot forms in a complete CG world. The third clip was based on the Davie Bowie song “Space Oddity”. This starts with a small 2D image of the astronaut singing the song on the International Space Station and then expands to the full screen in 3D and with full sound showing the earth through a porthole. The fourth and fifth clips were of musicians. One was actually not so good due to synchronization issues in the cameras being tested at the time. However, it was effective in demonstrating how well the Magi system has eliminated the errors in 3D capture and presentation when all is working well. For the Magi solution to be successful, there must exist efficient and cost effective ways to create and master, distribute and display. There also needs to be a business case to justify someone adopting the solution. As a result, Trumbull is investing considerable resources to develop the Magi technology as well as the ecosystem to support it. But he can’t do it alone, so he is working with partners and seeking investment and additional partners. In our discussions with Trumbull, we found no lack of enthusiasm, customer engagements, use cases and ideas to propel the business forward. Part of the challenge may actually be focusing in on the right directions. While Trumbull has developed the full Magi theater concept, he wants to be able to scale it to fit various use case needs, so the Magi Pod concept was born. This is a modular “pop-up” Magi turnkey theater idea where the structure, or pod, is constructed in a warehouse and fully outfitted with seats, audio, screen projectors, electronics – everything. Pods of different sizes are envisioned with the ability to order and have one delivered on site and set up in a matter of days. This might allow them to be quickly set up in multiplexes, theme parks, malls and other places where they can create excitement and new revenue streams for the owners. Trumbull’s goal is to be able to build these for $400 per square foot, (0.09 m² – so $4444/m²), fully featured. One of the clear focus areas is entertainment. Here, Trumbull sees Magi entertainment as more of a specialty art form than a mainstream movie format. Clearly there is precedent for such art forms including IMAX, Barco Escape and VR location-based entertainment. Trumbull wants to add Magi to the list and he thinks it might be classified as a multi-person, no-headset VR experience. But creating narratives and story-telling techniques may be different with the Magi format, which is why he is developing all of this test content to better understand the art form, determine what works and and how long the pieces should be. Here, he seems to be focusing in on 22-minute class content where consumers would pay $10 or so for the experience. Theme parks are another clear opportunity. Trumbull described a joint venture project he is working on with Virgin Galactic that would create a giant sphere in which a series of smaller venues would be located. 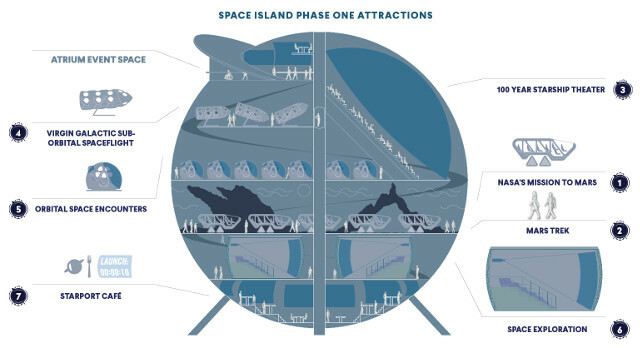 Called Space Island, it could be located at the Kennedy Space Center and would be capped with a full dome theater, several full Magi theaters along with a number of Magi Pods and smaller simulators using the same Magi technology. Planned elements include the ability to drive a Mars rover, walk on the surface of Mars using augmented reality (Trumbull is on the Advisory Board at Magic Leap), travel through interstellar space, experience a simulation of Virgin Galactic’s suborbital flight service, take mini adventures on moons or asteroids, and more. There is nothing like this and I think it would be extremely cool. I would pay $100 to spend the day there. Training and simulation is another big area of opportunity. Many companies spend a lot of money on training and simulation and the Magi solution offers a premium way to deliver this simulation. Trumbull has run the numbers in this segment and sees a $300M opportunity for Magi solutions in this market alone. Magi theaters and Pods are also attractive in a range of other venues like museums, festivals, water parks, zoos, cruise ships, sporting events, planetariums and more. But one of the more interesting opportunities isn’t a market segment but a country – China. The Chinese are enamored with new entertainment opportunities and are building traditional theaters, IMax theaters and Dolby Vision theaters at breathtaking speed. They have the money and they have the desire, so Trumbull is actively engaging with some of the biggest chains to explore the possibilities. He proposes to offer a revenue split with the exhibitor/distributor for content that Trumbull Studios produces and exhibited on Magi systems that they build and install. His business plan calls for them to build and install 1,000 Magi Pods over the next five years on a global basis. As you can see, there is a lot going on at Trumbull Studios and I was glad to get an opportunity to learn a bit more. I am sure there will be more to report going forward.